I had been wondering for a while what new store will open in Bourke Street Mall where Bra's N Things used to be. Then Sportsgirl moved up the road leaving behind their old store leaving yet another empty space in the Mall. 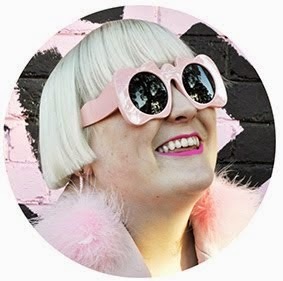 I had been hoping that maybe Rubi shoes will finally open a full blown store in Melbourne (apparently they are in some suburban shopping centres) instead of the current Cotton On plus Rubi shoes up the road on Bourke Street. Anyway I walked past the old BNT's space a few weeks ago and there were posters saying Forever New was opening soon in that spot. I had only seen that shop at the DFO on Spencer Street and never really liked it so I was a little disappointed. Then it did open, and boy is it tacky! On the other end of the spectrum is the new General Pants Co. store. 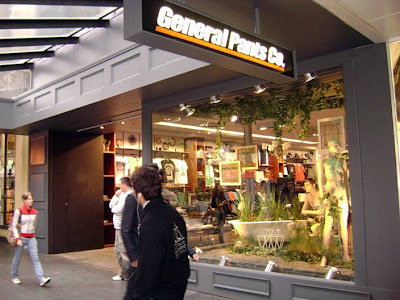 I have never liked General Pants much, but I do like this store. I'm not really one for chain stores you see (well expensive ones) I prefer op shops and small boutiques. Anyway when I read that this store was opening in the new issue of RUSSH magazine and that it was going to have different fashion designers design each change room I was excited. I went on opening day, which also coincided with the Bourke Street Christmas parade so it was very crowded. I really liked the indoor garden theme. It looks really cool with all the fake? greenery and wooden panels. It was too crowded to check out the change rooms that day, but I have since returned and wow they are cool. One is set up like a public toilet complete with a toilet bowl, another has a pay phone inside. This part of the store is by far the most interesting. Another thing I noticed was they had these cool chairs by DavidMetNicole which is an uber cool interiors store in Sydney. 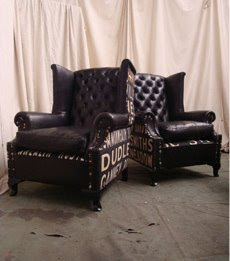 These chairs sell for a cool $4,900!!!! 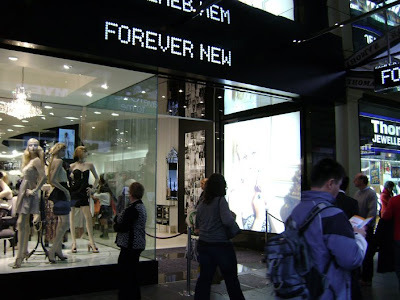 Anyway I can't find any interior shots of the store so watch this video from the opening day at the Bourke Street store. Yeah that video is lame and trying very hard to be young and cool, but you do get to see a lot of the store. what do you guys think? Have you had the chance to visit either store yet? I only recently saw my first Forever New shop, and I agree - Tack City! I couldn't get over all the frilly beige poly shite everywhere. There was one or two nice pairs of sandals though, and I did buy a cotton scarf off the clearance rack for $5, so it wasn't a complete wasteland - but close. And all those squished in racks everywhere! PS. I like GP though, things end up so insanely cheap on their sale racks. Putting together a large store would be mayhem without planning and only fitting! There is a huge difference between builders/designers! My boyfriend is a construction manager (building) and I'm studying architecture and there is such a huge difference in the way we think! But ouch! I live in the 'burbs but I can't say I'm attracted at all to Forever New's polyester palace. Anyway, just curious is all. Just came back from the city actually, and I would have to agree on both points. Forever new is just so shiny and clinical, there's no character or any interesting concepts at all. I thought the girl who greeted me when I came through the door was a mannequin until she said 'hi' to me, lol (I often confuse mannequins as real people too, so don't mind me!). General pants was cool. I did love the greenery! I would like to have something like that at home. Clothing-wise it was not so impressive. I haven't bought something from there for years, to me it's like a grown up version of Jetty Surf type stores. what you say about the rental designed by builders is so interesting and weird!!! i wanna make art about that!! Wow..interesting "chain store". I wish we had some chain stores in Oklahoma that were that decent. We get stuck with stuff that was the hip stores in Cali like 3 years ago..GAH! woah that GP video was so lame that i had to stop watching it. i went in there the other day and the staff were the biggest bunch of wankers ever. we were trying to find out about the custom hav's they are selling, but we couldnt get anyones attention as they were all too busy just having a chat with one another. its a nicer store than they usually have and i think it only has a few brands and not their usual range. havent been in forever new but there was one in the new westfield doncaster that i checked out and it was awful. Yay anon your comment made my day, I don't think I have ever laughed so much in my life. Real silk at Forever New? Shopping at OP shops isn't stylish? Wow what suburb are you from? I bet you LOVE Chadstone? Mall rat forever hey?